I'm selling this due to fund a road legal bike. I might do a trade if someone offers me a road legal bike. Condition: Basically Brand new, just ran in. It comes with a spare Brake cable and I might be getting new shrouds and mudguards etc soon. I also have the spare fork legs and bushes. If you buy it I'll also chuck in the stand. This bike has had 6 tanks through it. I have changed the oil and adjusted the valves and it all runs perfectly. There is absolutely nothing wrong with the bike. I got it in Noverber 2007 and I have mainly been doing wheelies on it. 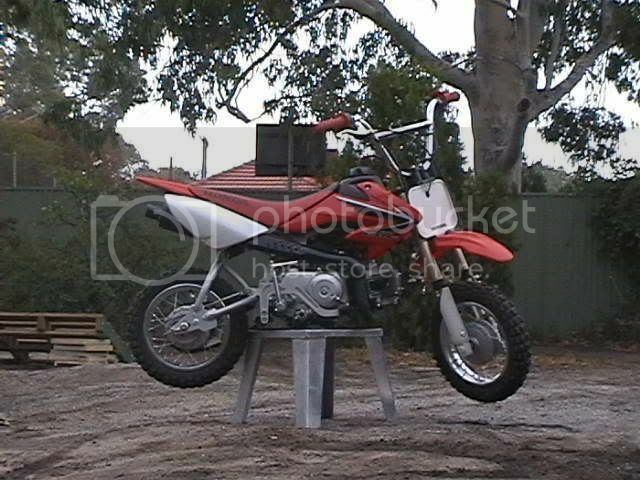 I have taken it to a friends farm once and I took it to a MX track once. 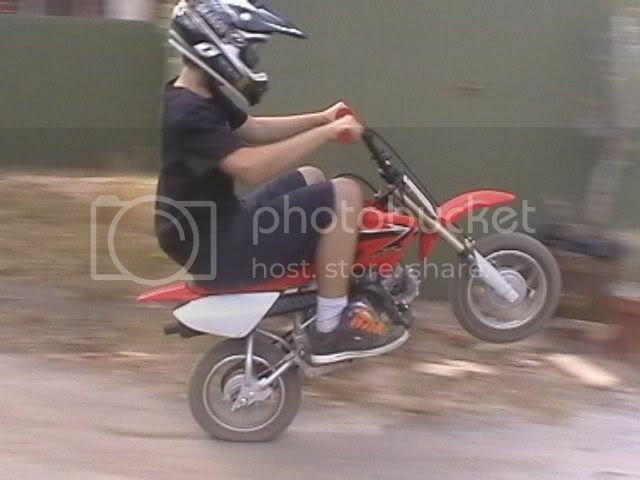 I have only done tiny jumps on it, litterally a metre long in my backyard and thats it. The frame and swingarm are in perfect condition. You're basically buying a brand new bike, just ran in with a lot of aftermarket parts to suit bigger riders. I still have both keys and the manual. Inspection and test rides are available. mmm. although i know i prolly wont ride it much at all, i'm thinkingb out this as i have a gsxr 03 model just sitting in the sheed that i need gone. however, if you are keen on a trade with cash adjustment, let me know. cheers. i'm in adelaide, you are in sydney. and what kind of cash adjustment are we talking about here? got your pm mate, but not really on msn. i'm not up to date with computers and what things they have lol. i got a mate who transports bikes, so getting the bikes swaped over if we come to an agreement wont be a prob. as i said in the pm, have a think bout it and let me know. cheers. p.s. looking at the pics it looks like your 50 has drum brakes front and rear yeah? how hard is it to get disc brakes front and rear on these suckers? and is it an expensive exersise? cheers. Isnt it cheaper and easier to have a drum rear brake if you are going to run a handbrake? yeah man its a lot easier to make one yourself when you have a drum on the back. thats cheap. good luck with the sale dude. i'm pretty sure there is a 50 forum. you should mabey throw it on there. might get more interest? Put it on www.miniriders.com.au though most of the riders on that forum have no money and comprimise quality for price and buy China bikes from eBay. Still, there are a handful of guys on there that ride Honda's. Put it up there anyway.